a group of interdependent organisms of different species growing or living together in a specified habitat. Community is something I have been thinking about a lot lately. I have felt the collective prayers, positive energy, wishes of strength and peace sent our family’s way. I have felt the rallying around my broken heart and at times feel like I am being wrapped in a cocoon of a strong love from our friends, peers, family, and fans. The donations of money have me feeling less stressed. The hours of conversations with friends has me feeling recharged and hopeful. The messages and texts of support checking in gives me some peace. The wonderful art that has been so generously donated by artists Carlos loved, respected and admired has blown me away. The hours and hours that people have spent coming together in the name of love, support, friendship and solidarity has me absolutely speechless. I don’t know what else to say besides, THANK YOU! Can there be a silver lining to a personal tragedy? I don’t know. But as the days go on, and as we approach the one month marker, the support has not weakened. The days after Carlos’ death, were my darkest and loneliest ever. I was sure I would feel that alone for the rest of my life. However, each day is a new chance to learn and grow. 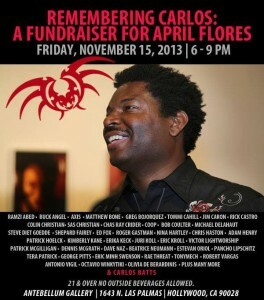 Carlos lives on through his art, his inspiration, his vibrancy, his smile and his community. You can bid on artwork online here. Or better yet, join us for a night of art, love and celebrating a beautiful life. Information on the Remembering Carlos Batts Fundraiser here.